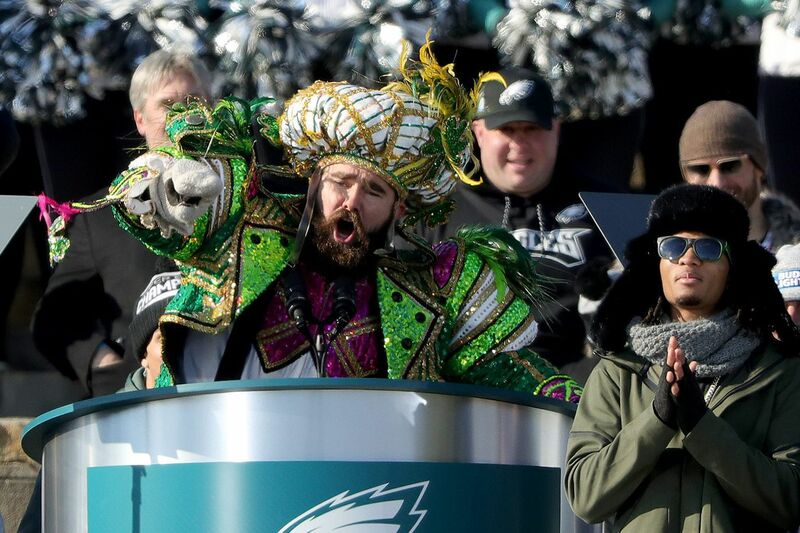 Dressed in Mummers attire, Eagles center Jason Kelce pauses during his colorful speech on the Art Museum steps. Eagles center Jason Kelce has lined up his next off-field gig. He'll play sax next week on stage at the Mann Center alongside the Philadelphia Orchestra. Kelce, who took up the saxophone in the fourth grade and continued playing in high school jazz and symphonic band ensembles, will perform with the orchestra on Tuesday, July 24, a Mann Center spokesperson said. He and the orchestra will play a single piece together: "Fly, Eagles, Fly," with Kelce using a baritone sax on loan from the School District of Philadelphia. Kelce has been a vocal proponent of music and its role in the life of the city's youth. The Eagles declined to make him available for an interview. But Kelce has spoken previously about its role in his life. "Music was a big part of my childhood, and it helped shape me into the person I am today and helped make me, believe it or not, into a better football player and a better overall person. I firmly believe that," he said in April before the All-City Jazz Festival concert at the Kimmel Center. Hosted by Merrill Reese, the event at the Mann marries the sounds of the orchestra with video highlights by Mount Laurel-based NFL Films from the Eagles' championship season. The music accompanying the highlight reel was written by NFL Films composers David Robidoux, Sam Spence, and Tom Hedden. A portion of ticket proceeds will be donated to the Mann's free arts and education programs and the Eagles Autism Challenge. Kelce is also appearing on Saturday, July 21, at the Ardmore Music Hall in a show to benefit ex-Eagle Connor Barwin's parks and recreation center-building Make the World Better Foundation. Kelce will host the show, which features West Philly rapper Chill Moody and local funk band Swift Technique. Kelce has recently played with the Avalon String Band and the Cleveland Heights High School Band, of which he was once a member. Next week's concert marks his Philadelphia Orchestra debut.